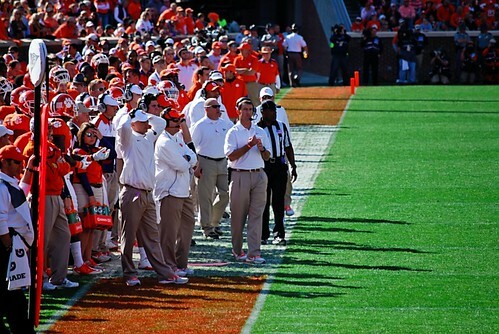 Clemson players, coaches, and fans needed a spark heading into the ACC Championship Game in Charlotte, NC. What they got was a firestorm from Clemson head coach Dabo Swinney. In Dabo Swinney’s Thursday post-practice media session, he took the state by storm calling out South Carolina head coach Steve Spurrier after Spurrier reportedly said, “We ain’t Alabama, we ain’t LSU, and we definitely aren’t Clemson” after the Gamecocks victory over the Tigers nearly a week ago. Swinney’s response to Spurrier was simple. Those comments and a four minute video have Clemson fans, players, and the entire state of South Carolina up in arms. Can that fire that has been found after 400,000 people viewed Swinney’s rant carry over onto the field for the Tigers has they take on the Virginia Tech Hokies Saturday night at Bank of America Stadium? Let’s take a look at how the teams matchup. The Virginia Tech offense is without a doubt better today than they were in week five - a long eight weeks ago. In early October, Logan Thomas had only started five games and was still trying to find his confidence and his niche in the Hokie’s offense. Now, he has completed 193 of his 319 passes for 2,525 yards, 18 touchdowns and seven interceptions. He has also carried the ball 125 times for 414 yards and ten touchdowns. Combine his arm strength, his running ability and his 6-6, 254 pound frame and he is a true dual threat quarterback. ACC offensive player of the year running back David Wilson lines up in the backfield with Thomas and if history is any indication he will have a big night against the Tigers as he rushed for over 120 yards in October. Virginia Tech will also have a healthy receiving corps this time around which will add another weapon to their arsenal. The once potent, high-powered Tiger offense has slipped dramatically in recent weeks. Some is due to injuries, but the majority is due to an apparent loss of confidence by quarterback Tajh Boyd. This game for the Clemson offense begins and ends with the offensive line and Boyd. Hopefully, Phillip Price will be back at left tackle to ease some of the pressure on the Clemson quarterback. Boyd must find his mojo again and that ice water in his veins in order to have the confidence to step up in the pocket and make the throws to his ultra-talented wide receivers. Sammy Watkins should be back in action and getting a little closer to 100% which will give Boyd another reliable target. Another must for the offense is finding a way to run the football. When Andre Ellington was given the opportunity last week, he appeared fresh and healthy. The run doesn’t always work, but offensive coordinator Chad Morris needs to stick with it if not for the fact that it might open up some big plays later in the game. Clemson special teams has been the lone consistency for the majority of the season. Kickoff specialist Spencer Benton continues to get better after coming back from a shoulder injury. Punter Dawson Zimmerman, when he is on, is a game changer. And Chandler Catanzaro has already won one game for the Tigers. Virginia Tech comes to Charlotte riding a seven game winning streak and all of the momentum and confidence in the world. Clemson, on the other hand, come in on the complete opposite end of the spectrum after two embarrassing losses to NC State and South Carolina (not Carolina, not USC, and not the main university in this state). All it takes is one play, one spark to get the Shock the World Tour back on schedule. Will Dabo Swinney’s attempt to rally the team and the fans be enough to ignite the Tigers to their first ACC Championship in 20 years? I have enjoyed your facebook page, but I'm not sure you can legitimately continue to call yourself a "Clemson girl" if you write a blog picking VT to beat us in the championship game. In my experience, true Clemson girls (as with all true Clemson fans), if they can't say something complimentary, don't say anything at all. From your website: "We are not affiliated with Clemson University in any way, but love the school and only wish to support it and promote Clemson love across the world!"